Hi friends! I hope everyone had a fabulous weekend. We had our Living Christmas Tree program at church and did lots of other festive Christmas things. ALSO, my dear friend Beth (remember the baby shower I threw for her last month?) had her sweet- beautiful!- baby girl, Ella Kate, this morning! Needless to say, it has been a wonderful weekend! We also finally finished putting up all of our Christmas decorations. I seriously can't explain how much I love walking into our living room and seeing the sparkle of white lights on our tree and mantle. It's just so festive! Today, I thought I'd share quick tour (and recap!) of some of our Christmas decorations. Let's start with the outside! We've actually never done outdoor decorations at our house before this year. It may have had something to do with the fact that our old house was in a quiet neighborhood where not many people decorated their homes for the holidays. But now, we're in a historic area of our city, where lots of people decorate and there's even a Christmas home tour! I went back and forth on whether to do lights or not... I just couldn't decide what kind of lights or the pattern I would want to do (icicles? just around the front door? wrapped around garland? outlining every detail of the house?). So I chose the easier route- wreaths on the windows. I grabbed a few $3.50 wreaths (50% off, of course!) from Hobby Lobby, along with a few pre-made bows ($1.50 each) and matching ribbon. David and I froze our fingertips off (umm- by the way, it's SNOWING here in Georgia tonight! Unseasonably cold weather!) but got them up quickly. And voila! 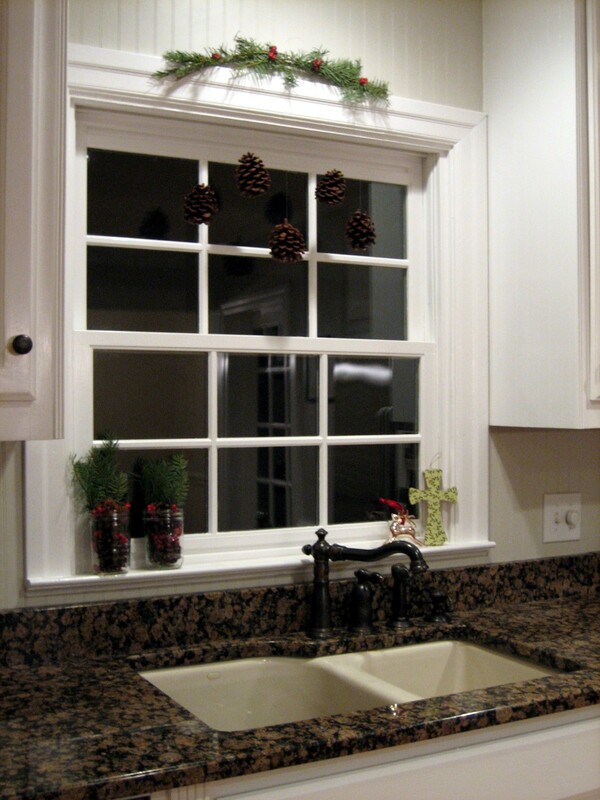 Simple and sweet wreaths on the windows! My favorite part is that David installed some lighting so that you can see the wreaths at night. Here's a really awful picture of the whole house in the dark. But at least you can check out what our neighbors see as they drive by! How pretty is that?! We may just keep the lights out year-round. They really make our home look a million times more welcoming at night! Now back inside the house, out of the snow! I won't take you through each and every little back-of-the-toilet vignette (wait, am I the only weirdo who actually has a cute little arrangement on the back of the toilet in our guest bathroom?! would it help if I told you I set up a little arrangement there because our guest bathroom's pedestal sink offers virtually no counter space for cute vignettes?? no, I'm just weird? 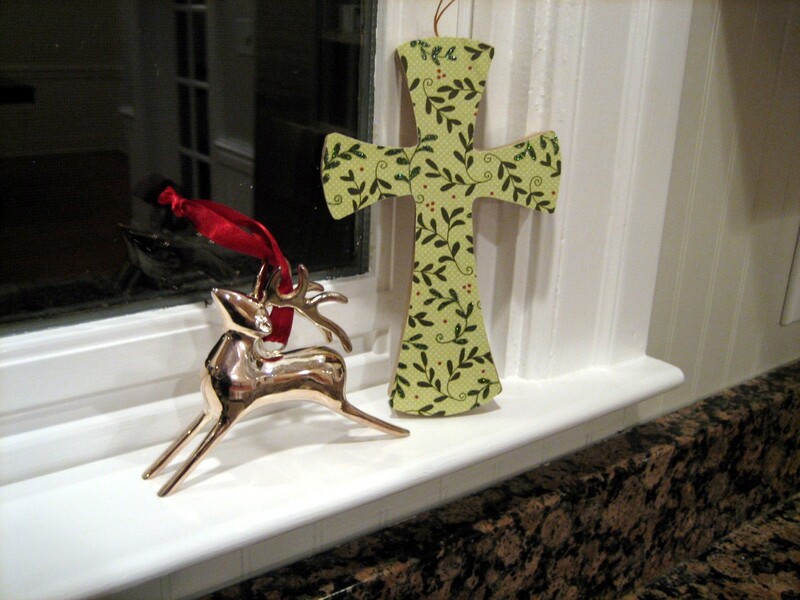 I thought so....), but here are some of my favorite Christmas decorations around our house. A yarn wreath that I made and that's hanging in my kitchen (tutorial on this later!!). Our Christmas tree (check out the how-to on our tree's DIY pom pom garland). 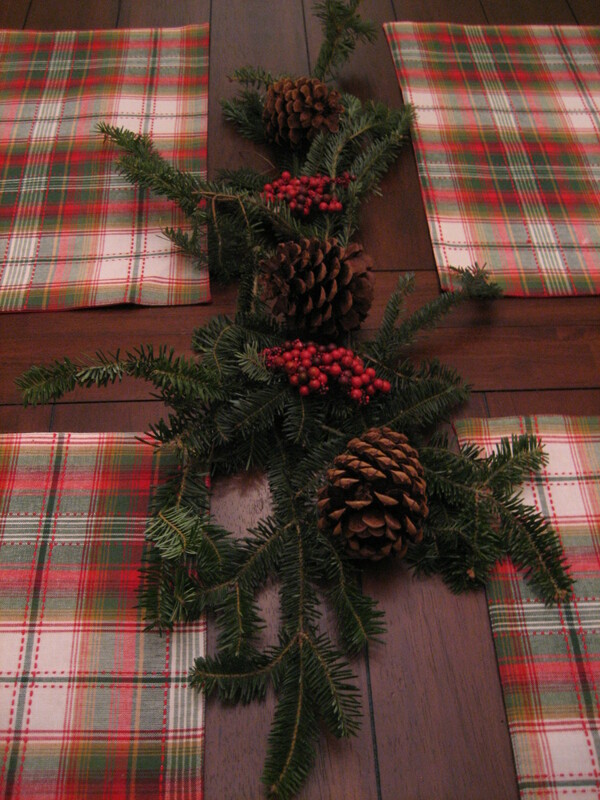 Our kitchen vignette (here's the tutorial on how to make my pine cone mobile). And my living room fireplace mantle. So that is Christmas at my house! Do you have all of your decorations up yet or are you like me and just now finishing up?! very cute! Love the wreaths outside! Just beautiful!! Love the wreaths on the windows, and your mantle! It all looks beautiful and festive! The wreaths on the outside windows are very classic! Love your red door! We have the same color scheme on our house. Great pops of warmth and color throughout! Love the pom pom garland and the wreaths look so nice on your home with the lights shining on them...love the mantel too! Everything is awesome! And congrats to your friend on her sweet baby girl! 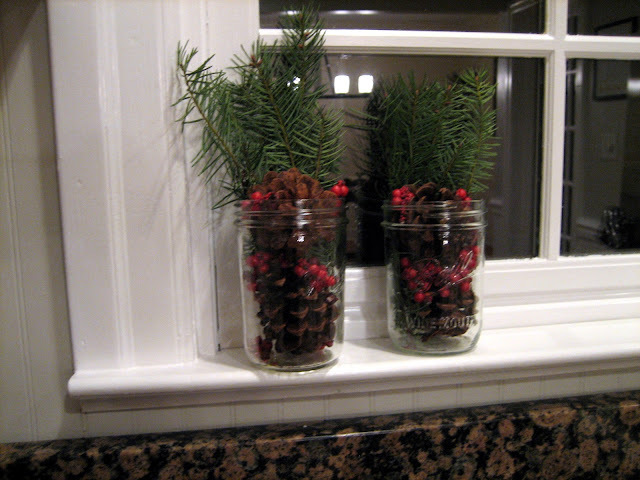 I love the pine cones in the mason jars. Little jars like that are so cute! Aw, I love it! So cozy! I'm slowly getting our house Christmas-ified. 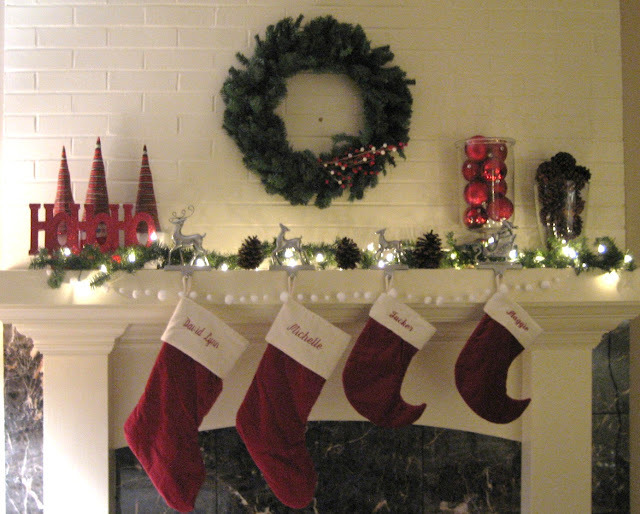 Your mantle looks great and I love that white brick! Everything looks great Michelle. Adding the lights to illuminate the wreaths really makes a difference. We use spotlights for ours. Love the yarn wreath! So cute! The wreathes on the windows really add some festivity to the outside, love it! Very cute! Your home is so lovely! Love it all! The pom pom garland is super cute! I really the out door wreaths. Your house looks beautiful wearing them. You lucky to have a red front door! Everything looks very festive and simple. I love it! Your home looks so welcoming and inviting! No one puts up lights in our neighborhood (I call them all Scrooges), but last year and this year we got some new neighbors and, even though it's a little tacky, at least they have lights up! :-) Merry Christmas! Your home looks wonderful! 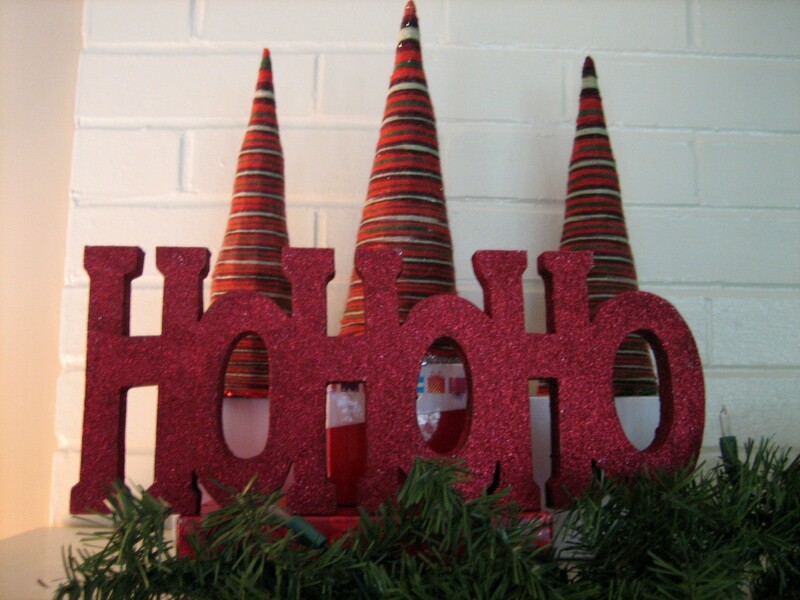 That garland is a fabulous idea! Everything looks great! I love the garland! I love everything!!! So Cute. My favs are the pinecone mobile and the yarn wreath! Your home is beautiful -The wreaths on the windows and lit up at night is so welcoming. Your tree is so pretty and I am going to make a pinecone mobile -thanks for sharing your idea . Beautiful tour my dear...the outdoor wreaths add a special touch that is a perfect touch. I want that yarn wreath, those little flowers are adorable! I really loves your tree & the wreaths on the outside! Very pretty! Love the colors you've used in your home! Merry Christmas! I love your home. You have done a beautiful job with your decorations. I love the simple sweet wreaths and would love to do that at my house, but my husband is more the Clark Griswold type! Mind if I pop in and hang out? It's all so pretty. I LOVE the outside . . the combo of the wreaths, the door, the shutters. Just beautiful. And the wreath is adorable. Your home looks gorgeous. The wreaths and lighting on the outside are beautiful! And everything is just as pretty on the inside! Your yarn-wrapped wreath is fabulous! Love your red front door and how it goes so well with your Christmas decor!! Oh everything is gorgeous!! I love all the wreaths, girl you are so good! I just love your home! Very lovely. The picture of the outside of your house has me envious. Right now our house is painted green with dark blue shutters and a red door, and we plan on painting it white hopefully this year. I just love the white house, dark shutters, and red door combination. So pretty! Hope you are having a wonderful Chritmas season! of course I decorate the back of the toilet! all the cool kids do! your house looks gorgeous...and i love the wreaths outside! I need to do that next year! Your home is really lovely! I always love a white home with black shutters and a red door, especially during Christmas. The wreaths look great. I love the little pom-pom garland on your tree. So cute! You have a lovely home and a beautiful tree! I'm a new follower! Your house is stunning! I love the wreaths and your tree! It looks fabulous! And, although they're not Christmas decor, I adore your front door and the light beside. Everything looks so great - I love the snowball garland! Your house looks so warm and cozy. Love all the yarn crafts! I'm so happy I saw your blog, love your style and your yard wreath! We did wreaths in the windows too, and I was crazy and made them all. I think after Chistmas I will buy some fake ones for next year. I do love the way they look though. I like how your house and decor is very simple, but really pretty. Have a Merry Christmas! Beautiful home. I love all the touches of red you have placed around. Nothing said christmas quite like red! Your house looks like it could be in my neighborhood Michelle. We live in an older neighborhood too and people get into outdoor decor here. I love all of your wreaths and maybe next year would like to try making that pompom garland. Thanks so much for joining the "Tour of Homes" party! Happy holidays!